Black Bean Corn Farro Salad - Perfect for Leftovers! 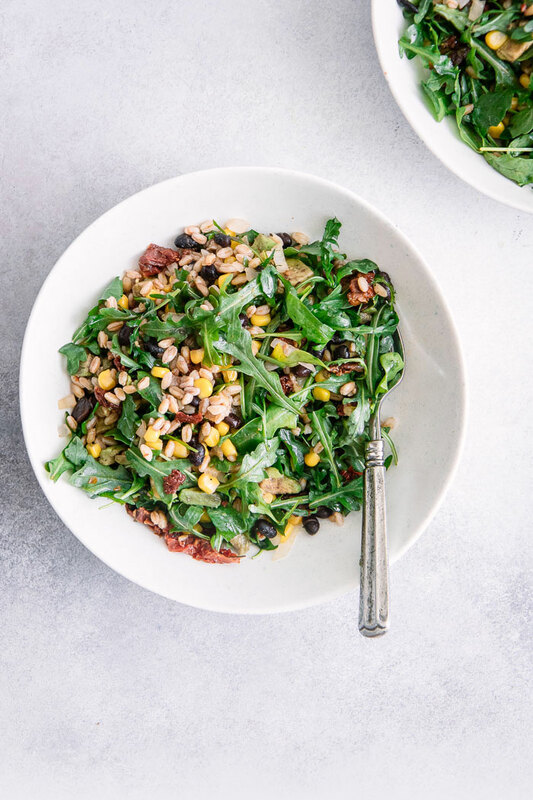 This Black Bean Corn Farro Salad is a simple vegan grain bowl made of Italian farro, black beans, fresh roasted corn, and sun dried tomatoes. A perfect weeknight meal with enough for leftovers! Getting into the habit of bringing lunch to work is hard. After work, a stressful commute, and trying to get dinner on the table, the last thing I want to think about it making another meal for lunch the next day. My weeknight strategy is to make double the amount of dinner so there is enough for lunch, but sometimes a prior commitment or weeknight meal out = no leftovers for lunch for the next day. I’m going to admit I totally made this phrase up, but hear me out. Sunday Salads are easy, keep-in-the-fridge recipes (they don’t have to be salads!) that can be pulled out and eaten all week long. Whether it’s a quick workday lunch or a side dish to balance out weeknight leftovers, Sunday Salads are backup dishes that can be kept cold and eaten throughout the week. They’re usually made on a Saturday or Sunday (hence the clever name) and eaten all week long. They’re your backup, your weekday meal security blanket. Or possibly eaten straight out of the bowl right when you get home from work because you’re starving and don’t want to make a full meal yet. I may or may not do this nightly. While I do about 70% of the cooking in our house because I genuinely enjoy it, the Italian Husband (Francesco) is not a kitchen noob. He doesn’t experiment as much as I do with new ingredients and flavors, but he has a few staple dishes he does well. 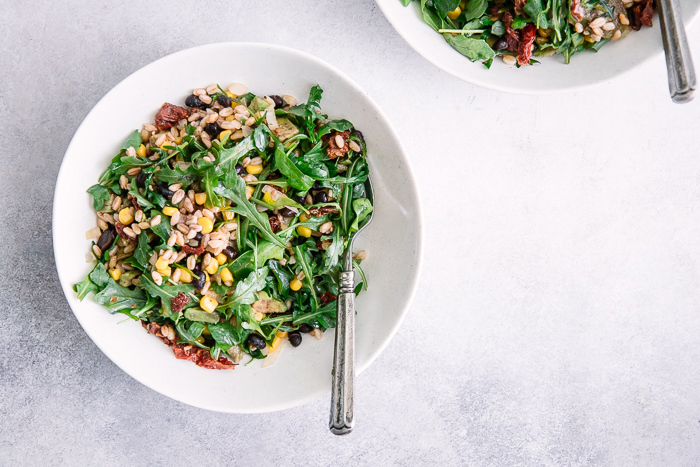 And this Southwest Black Bean + Corn Farro Salad is one of his favorites. As with any meal on Fork in the Road, this grain bowl recipe is highly customizable and you can (and should) experiment with different ingredients and flavors. This may be an unpopular opinion, but I believe recipes should serve as a framework and not be set in stone. Everyone’s palette is different and if you’re not into an ingredient we use here, feel free to substitute with your own (and let me know how it turns out!). Did you make this Black Bean Corn Farro Salad? Leave a comment and recipe rating below and let us know how it turned out. 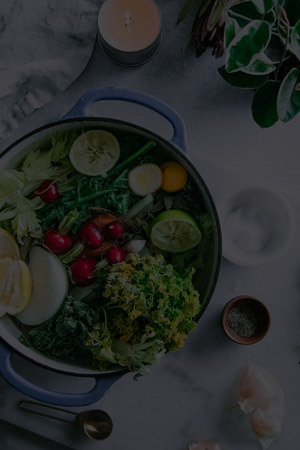 Save it for later by pinning to your favorite salad Pinterest board and tag me on Instagram so I can see your grain bowl creations. 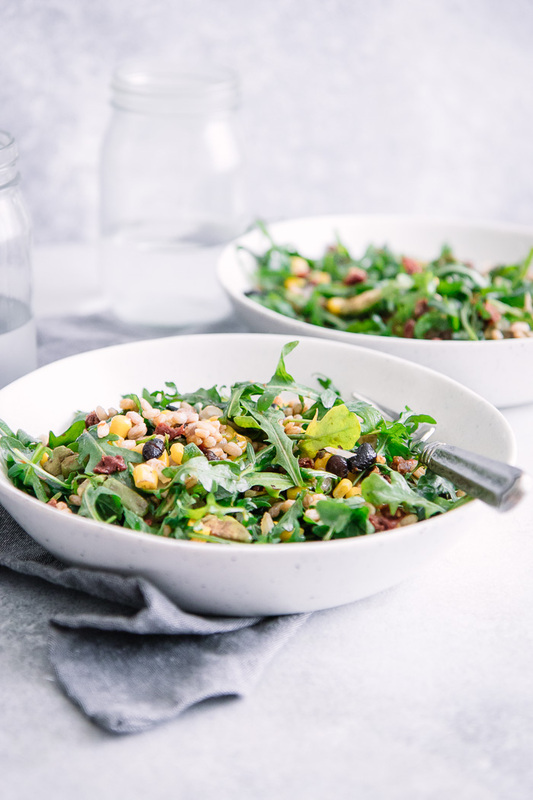 Served warm or cold, this Black Bean, Corn & Farro Salad is an easy weeknight dinner and perfect for leftover lunch the next day. Bring one cup farro and two cups water to a boil over high heat in a medium pot. Once boiling, cover with lid and reduce to low. Cook about 15 minutes or until farro is softened, but not overcooked. Drain and set aside to cool. Once cool, mix farro, arugula, black beans, sun dried tomatoes and their oil, red onion, cumin and salt and pepper in a large bowl. Serve immediately or keep cool in refrigerator for up to five days. Leftovers & Storage: This grain bowl can be stored in the refrigerator for up to five days and can be eaten hold or cold as leftovers. 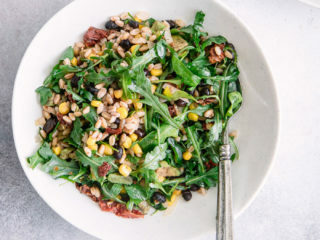 Nutrition: This Black Bean Corn Farro Salad is a great vegan grain salad recipe that is low in fat, sugar, and sodium, which providing fiber from the whole grain farro and plant-based protein from the black beans.